René de Possel's parents were Marthe Seignon and Raoul de Possel, who was an examining magistrate. René attended the Institution Mélizan and the Lycée at Marseille before going to Paris to study at the École Normale Supérieure. After completing his Agrégé de mathematique, de Possel continued to undertake research for his doctorate. He spent time studying at Munich, Göttingen and Berlin which had a major effect on broadening his education. In 1931 he published a result on the conformal mapping of a simply connected domain in a Göttingen journal. He introduced the notion of sets of maximum type in a paper published in 1932, and this concept was also studied in his doctoral thesis which was published in 1933. His studies were helped financially by the award of a Rockefeller Fellowship in 1930-32 before he gained his first appointment as Maître de Conférences at the Faculty of Science at Marseille in 1933. He then held the same position in the Faculty of Science at Clermont-Ferrand from 1934 where he joined Szolem Mandelbrojt. They would go to Paris to attend the Séminaire de mathématiques in the Institut Henri-Poincaré every second Monday. This gave them the chance to visit bookstores and libraries as well as meet up with other friends which they had made during their studied in Paris. They met regularly for lunch with their friends at the Café Capoulade in boulevard Saint-Michel near the Luxembourg Gardens and it was here that he became one of the founder members of the Bourbaki group. In the early stages of Bourbaki, de Possel was involved on a subcommittee which considered how they would present integration theory. His views on integration are to be found in the expository article Les théories modernes de l'intégration Ⓣ which he published in 1946 and in which he sketched an abstract form of the Riemann-Stieltjes integral. On many issues de Possel and André Weil were on opposite sides in the arguments. At the first Bourbaki congress in July 1935 de Possel was still an active member of the group and much involved with contributing but, largely due to differences with Weil, he dropped out of the project. De Possel married Yvonne Liberati on 12 August 1935; they had three children, Yann, Maya, and Daphné. In 1936 he published an important book on game theory, namely Sur la théorie mathématique des jeux de hasard et de réflexion Ⓣ. He published an article in 1935 which was the first to present a general theory of differentiation in abstract measure spaces and in the following year he published another article in which he gave complete proofs. De Possel was appointed as professor in the Faculty of Science at Bresançon, then in 1938 professor in the Faculty of Science at Clermont. 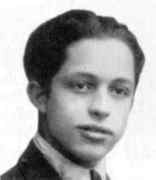 In 1941 he was appointed to a chair of mathematics in Algiers. He held the chairs of rational mechanics, then differential and integral calculus. In 1951 he was appointed to the specially created chair of higher analysis at the Faculty of Science at Algiers. From 1959 he was professor of numerical analysis at the Faculty of Science in Paris. We look briefly at the mathematics papers which de Possel published during these year. In 1939 he published Sur la représentation conforme d'un domaine à connexion infinie sur un domaine à fentes parallèles Ⓣ in which he developed further the ideas on conformal mapping of a simply connected domain which he had published in 1931. In the second half of the 1940s he published a considerable number of papers. We mention Sur l'indétermination de la puissance d'un torseur réparti Ⓣ in which he gave proofs of some formulas of use in the mechanics of continuous media, where the differential elements are subjected to couples as well as forces per unit volume; Les principes mathématiques de la mécanique classique Ⓣ which was based in ideas due to Brelot; Sur la définition d'un torseur réparti et sur l'évaluation de sa puissance Ⓣ which examines when external forces on part of a body are equivalent to couples alone; Initiation à la topologie Ⓣ resulting from work carried out in Portugal; Sur les systèmes dérivants et l'extension du théorème de Lebesgue relatif à la dérivation d'une fonction à variation bornée Ⓣ extending the classical theorem for linear Lebesgue measure; and La notion physique d'énergie vis-à-vis des définitions du travail et de la force Ⓣ which considers the formulation of classical mechanics given by Brelot. Among his hobbies were watersports, and in particular he loved motor boats and underwater fishing.